Drama, France/UK/Czech Republic, 2007, 140 min. 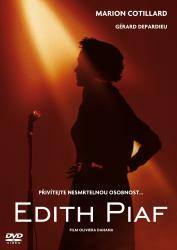 Synopsis An un-chronological look at the life of the Little Sparrow, Édith Piaf (1915-1963). Her mother is an alcoholic street singer, her father a circus performer, her paternal grandmother a madam. During childhood she lives with each of them. At 20, she's a street singer discovered by a club owner who's soon murdered, coached by a musician who brings her to concert halls, and then quickly famous. Constant companions are alcohol and heartache. The tragedies of her love affair with Marcel Cerdan and the death of her only child belie the words of one of her signature songs, "Non, je ne regrette rien." The back and forth nature of the narrative suggests the patterns of memory and association.